I have made every attempt to make these book binding tutorials as complete and fail proof as possible, every step of each element is illustrated copiously with photographs and diagrams accompanied by a detailed textual description. Some of these book binding tutorials are aimed at book binders with some experience, but the manual on gilding is aimed at the novice, I have deliberately simplified this gilding method in order to give those starting gilding onto leather a better chance of getting some good results. Just click on the image of the book to be taken to a page where you can read more about the manual and download it if you wish. Please note you will need Adobe Reader to view these .pdf files. If you do not have Adobe Reader on your PC you can download a free copy here. To download these files using Internet Explorer right click on the link and select "Open in new window". If using Firefox right click on the link and select "Open in new tab" then allow the files to download. Book binding Tutorial. Vol.I Silver & Vellum Book Clasps. 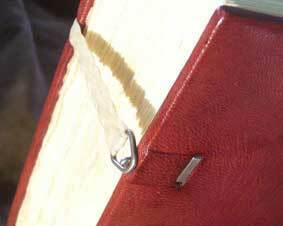 Every experienced book binder should know how to make a set of Book Clasps. This method is a development of a set of book clasps I first saw made in a manual of book binding by Douglas Cockerell. They are simple and elegant and can be applied to any book provided the board thickness is not less than 3mm. Vellum and sterling silver make a very attractive combination. Bookbinding Tutorial. Vol.III Gilding on Leather. This bookbinding tutorial shows how to gild onto leather using a simple step by step process. This manual illustrates the use of composition gold leaf, but the process will work just as well if you choose to use genuine gold leaf. This manual is aimed at the novice and it is to be hoped that with a little care you will be able to get very good results using this method. Free! Bookbinding Tutorial. Vol.IV Single Section Binding. This part of this series of bookbinding tutorials provides a very elegant solution of the problems encountered when dealing with a single section binding. Book binding Tutorial. Vol.V A Variation of Paste Papers. This manual was put together in order to help someone set up a small production facility making what I call paste printed papers. A simple process for making your own decorative papers. Free! Bookbinding Tutorial. Vol.VI Forming Cloth & Leather Corners. This bookbinding tutorial explains the technique behind forming the corners for a cloth bound book as well as how to form corners when binding in thin and full thickness leather. A copiously illustrated step by step guide.Free! Book binding Tutorial. Vol.VII How to Make Parchment Paper & Imitation Vellum. Parchment paper and imitation vellums have been made by generations of inventive bookbinders who sought something that looked and handled like old parchment. This manual shows you the simple method of achieving this. You can use an imitation vellum as a book covering material. Free! Vol.VIII Make Your Own Sewing Frame. Here are some simple to follow plans for making your own sewing frame. Free! Vol.IX All About Grain Direction. It is vital that you understand the importance of grain direction in bookbinding materials, this bookbinding tutorial will explain what you need to know and explain how to test for the grain direction. Free! Vol.X Side Sewing or stab sewing is a very old way of dealing with loose sheets, this manual shows you the method. Free! Vol.XI How to Achieve Various Distressed and Antique Finishes to Gold Leaf. This manual will be of interest to anyone who uses composition gold leaf, or genuine gold leaf for that matter, it will also be of interest to the more adventurous book binders. Add the beauty and sparkle of gold leaf to your craft projects, such as scrapbooking, canvas, ceramics, plaster, glass, paper, and much more. Free! Vol. XII The Minimal Bookbinder Is in the pipeline, this bookbinding tutorial is aimed at those who feel they are prepared to commit themselves a little to the craft of bookbinding by purchasing a minimum of equipment and materials, you can if you are inventive use very little equipment at all, but it is undeniable that using a well made piece of equipment is a pleasure in itself. Free!